As tomorrow is the first day of the Tokyo Game Show 2014, I'm posting this news roundup earlier than planned to ensure I have a clean slate in case anything exciting is reported. Whether there is news of any new game or not, there will probably be a media presentation at the show to announce upcoming tie-ins and merchandise (and hopefully, dates for the next Basara Matsuri). I also think it's likely we'll see the two new mascot characters from last week's Inazuma Rock Fes appearing at the show to greet visitors. So for now, here's a wrap-up of the Sengoku Basara news from the last couple of days. 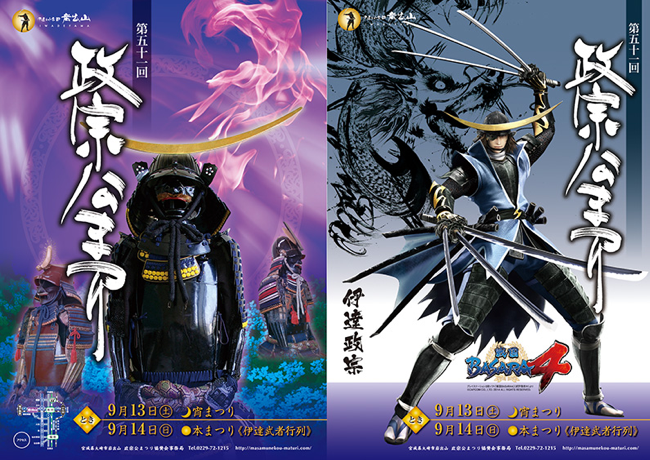 Two more traditional festival tie-ins have been announced today to join the Yukimura exhibition in Osaka and last weekend's Masamune-kou Matsuri, which has posted its official poster artwork since my previous update. The first of the new announcements is that Sengoku Basara's Katakura Kojuurou will support this year's Oni Kojuurou Matsuri once again. The seventh annual festival will take place on 4th October 2014 in its usual home of Shiroishi City, Miyagi Prefecture. It celebrates the second generation Katakura Kojuurou (Katakura Shigenaga) and features historical reenactments at the local castle. Even though the character from the game is based on the first Katakura Kojuurou (Katakura Kagetsuna), the series blends his feats with those of his son and the festival honours them both. Kojuurou's voice actor Morikawa Toshiyuki often takes time out from his busy schedule to visit Shiroishi for the festival each year. I wonder whether he'll be mingling with the crowds of fans again this time? In addition, fans who visit Motochika's birthplace of Nankoku City in Kouchi Prefecture between 11th October 2014 and 12th January 2015 can participate in the 'Chousokabe Motochika Rally 4'. 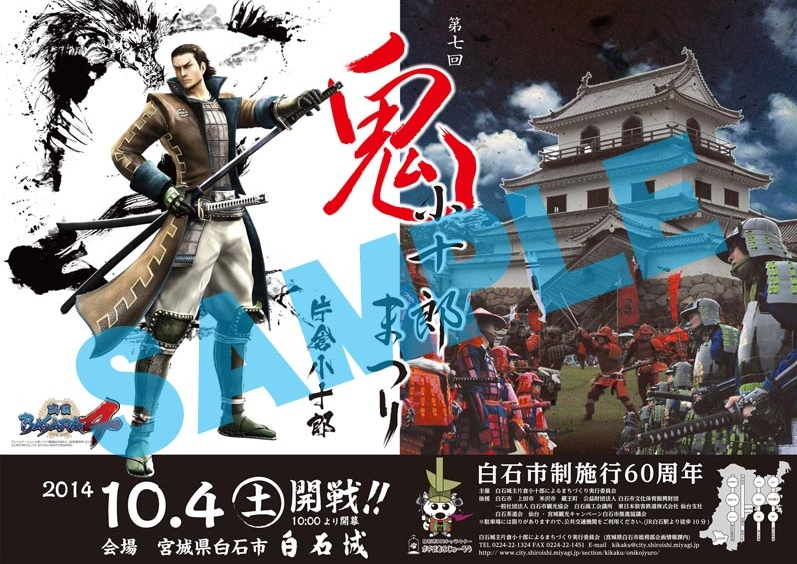 It's a special tourism event designed to let visitors follow in Motochika's footsteps via a 'real rally game', and this time the posters for the game will use artwork from Sengoku Basara 4. Since it's a game, it's less straightforward than a plain old festival. Participants have to visit the locations specified on the pamphlet's 'treasure map', take pictures of themselves at the various sites and then email them to Nankoku's tourist board for a chance to win prizes. It sounds pretty fun! As regular readers know, the bonus Hoshi Souichirou and Seki Tomokazu's 'Sengoku Basara: Judge End' Radio CDs which come with the DVD/BD releases of Sengoku Basara Judge End each feature a special episode with a seiyuu guest presenter. The staff have now revealed the guest who will appear on the fourth volume and it's to be Nakahara Shigeru (Mouri Motonari). These announcements never end! 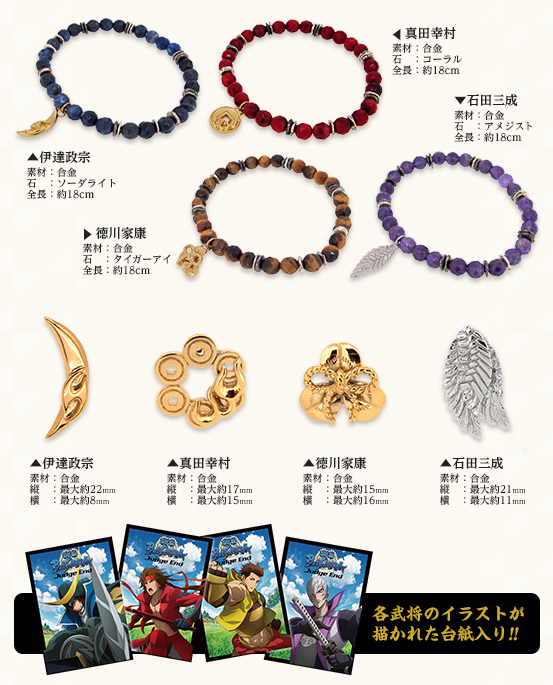 The first new goodies from the official anime website is a selection of four natural stone bracelets and pins. 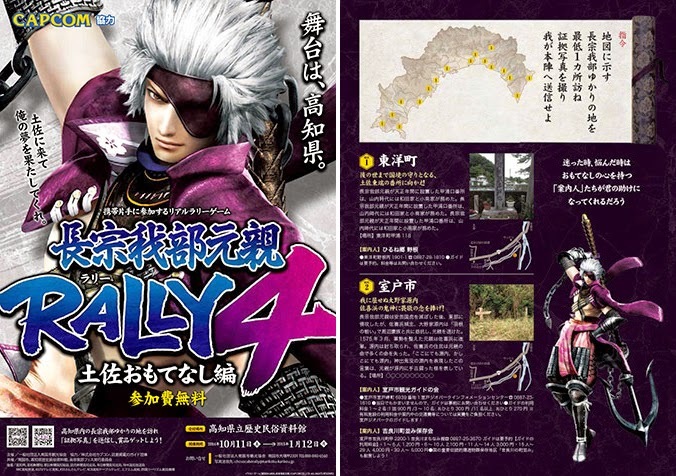 The designs are based on Masamune (sodalite), Yukimura (coral), Ieyasu (tiger's eye) and Mitsunari (amethyst). Each piece of jewellery comes with an illustrated backing card of the character it's based upon. The bracelets will cost ¥3,800 each while the pins are ¥1,500. They're planned for release at the beginning of October 2014. 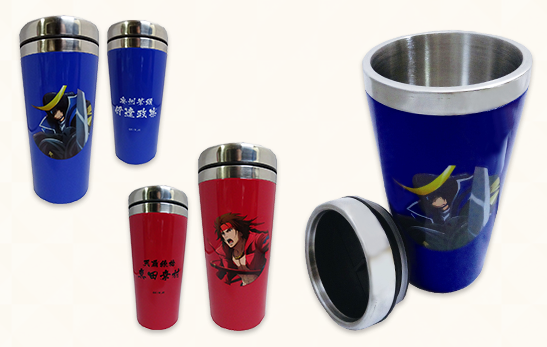 There will also be a pair of stainless steel tumblers priced at ¥1,500 each. They're suitable for hot and cold beverages and each comes with a lid. The release date is expected to be between late November and early December 2014. There was some interest in these towels when they were first announced so here's an update: fans who have access to a proxy buying service can now reserve the towels through OOPARTS Online. I'm so exited about the upcoming news of basara at tokyo game show!!! I hope they talk about the next installment. ( I wont lose my hope to see ranmaru or Nohime in the next game >.< lol) Thanks for reporting the awesome news here!!! I play a lot of games and check the news about them, but I am only going this crazy when it comes to basara! The bracelets are so cute! I love the tumbler too! I have too much basara stuff at home...I will just have to make more place! The last episode of judge end was so nice! Well I'm a big fan of Matsu and Oichi. What Matsu said was so beautiful. We saw Nagamasa!!!!!Kyaaa. So happy they didnt forget about him. Miss the old time . Capcom doesn't seem to allow a timeshift for their stream so I am going to get up super-early to try to watch it. I can't wait! We need Ranmaru and Nouhime back for the tenth anniversary, it's been way too long now. And they'll have good interactions for Katsuie too, so there's an excellent excuse for them to return. I think the Mitsunari and Ieyasu bracelets are my favourite, but I don't usually wear jewellery... I hope some people buy them so I can see more pictures! Just a few more hours to wait until the presentation!